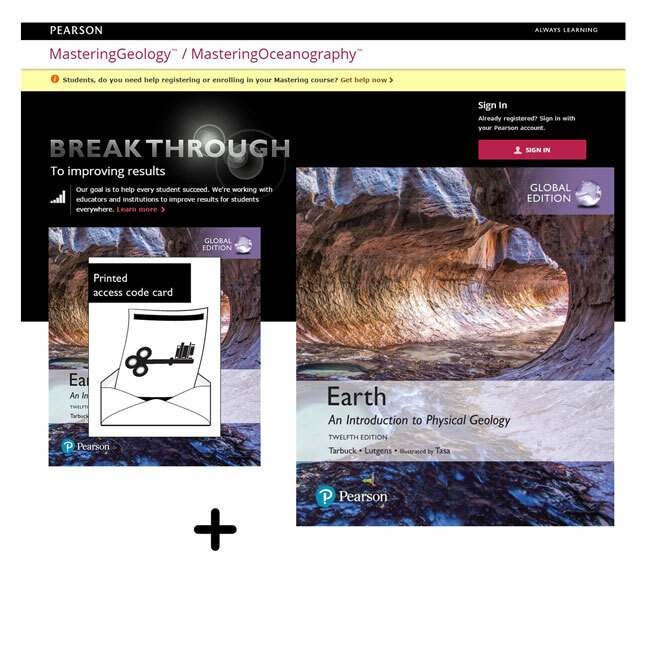 This pack contains 1 copy of Earth: An Introduction to Physical Geology Global Edition + 1 printed access card to Modified MasteringGeology with eText. With its strong readability and engaging, instructive illustrations, this trusted bestseller returns with a hybrid and streamlined focus on core principles. Earth: An Introduction to Physical Geology maintains a learning objective-driven approach throughout each chapter: The text provides students with a structured learning path, tied to learning objectives with opportunities for students to demonstrate their understanding at the end of each section. The authors’ emphasis on currency and relevance includes the latest thinking in the field, particularly in the dynamic area of plate tectonics. The Twelfth Edition, Pearson Science’s first augmented reality, hybrid textbook, uses the BouncePages image recognition app (FREE on both iOS and Android stores) to connect students’ digital devices to the print textbook, enhancing their reading and learning experience. Tarbuck/Lutgens’s innovative SmartFigures feature has been expanded, adding new digital content via Project Condor, Mobile Field Trips by Michael Collier, Animated Figures, and additional tutorial videos from Callan Bentley. This edition also includes Modified MasteringGeology, the most complete, easy-to-use, engaging tutorial and assessment tool available. Modified MasteringGeology is an online homework, tutorial, and assessment program designed to work with this text to engage students and improve results. Interactive, self-paced tutorials provide individualized coaching to help students stay on track. With a wide range of activities available, students can actively learn, understand, and retain even the most difficult concepts. Modified MasteringGeology is not a self-paced technology and should only be purchased when required by an instructor. The duration of access to Modified MasteringGeology is set by your instructor for your specific unit of study.